This is a hearty winter dish of seasonal British vegetables, with some middle eastern spicing. 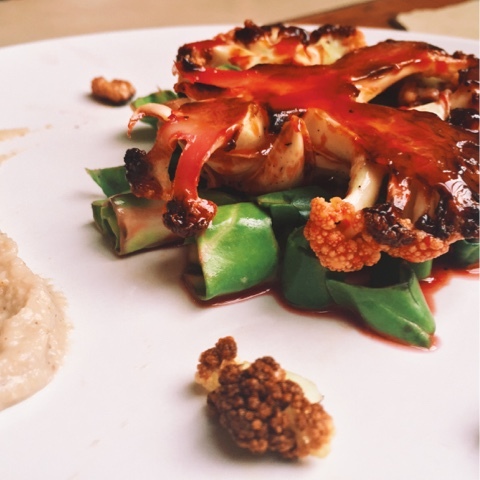 The cauliflower is braised in blood orange juice and cardamom. The Jerusalem artichoke (a root, which is no relative of the artichoke but recalls its flavour) combined with tahini, garlic and walnuts creates a deep, sweet and earthy contrast to the zesty cauliflower flavours. Cut 2 cauliflower steaks by slicing carefully, removing the leaves and stem, placing the cauliflower stem side down and slicing across parallel to the core. Reserve the florets that crumble off. Slice the chard leaves from the stem (keep the stem) and thinly slice. Marinate in the red wine vinegar with salt and a pinch of sumac. Slice the reserved walnuts in half length ways, gently heat in a pan with the apple molasses or honey mixed with red wine vinegar and set aside. Heat a frying pan and add 4 tbsp olive oil and the cardamom pods. Season each side with salt and fry the cauliflower steaks approximately 10 minutes each side on a medium heat. After 10 minutes in the pan add the florets set aside earlier. Once it has colour (preferably some charred edges) and is softened, juice the oranges and add them to the pan with a generous drizzle of olive oil simmer spooning it over the cauliflower until it reduces to a sticky consistency. Swirl the pan and keep an eye on it otherwise the orange may burn and stick. Reheat the artichoke sauce at this point. To serve place a large tablespoon of the chard on a plate with the cauliflower steak on top and a large spoonful of the orange sauce. Place a spoonful of the artichoke sauce next to it with a few of the florets and reserved walnuts.